For the last few weeks the Pre-school class has thoroughly enjoyed learning about the season of spring and all of the beautiful changes they are beginning to see in the weather. 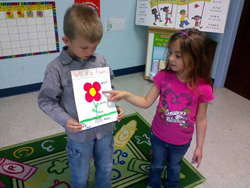 The class has learned the parts of a flower, what flowers need to grow, names of flowers, and even planted their own to care for and grow! Each child got to pick the type of flower seeds they wanted to plant and even learned that all flower seeds look different! Some of the flowers chosen were Calendula, Morning Glory, Cosmos, Wild flower, and Marigold. 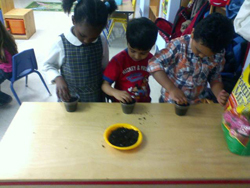 Planting was a great way to put to use all that they have learned!